A recent boom has emerged in Berlin: These days this up and coming trendy city is known for its growing community of artists and designers. 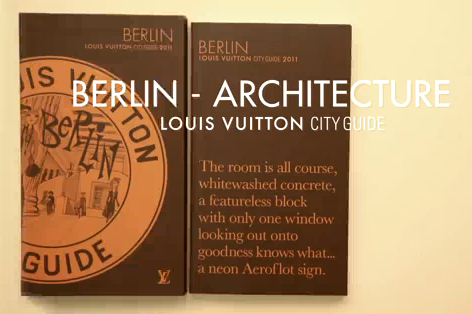 Louis Vuitton's new travel guide for Berlin 2011 promotes just that--an element in which the city has been getting quite an inviting reputation from: its architecture. Berlin's design has certainly gone through multiple transformations: pre and post World Wars--with Western Germany claiming its aesthetic distinction from its Eastern counterpart. Subsequent to WWII, the old Mitte (Berlin Wall middle ground), needed much refreshing and refilling. It became a place where architects had the chance to build with a sense of experimental freedom--to represent the new, juxtaposed with resurrecting the old. And the result: Have a watch for yourself in pure LV style.